We give you access to the best civics education resources of the network’s 26 organizations. Find classroom materials for any grade level. Want to teach the First Amendment? Start here. What makes the Civics Renewal Network different from doing a Google search? Curated content. A Google search returns dozens, if not hundreds of unsorted results. Some of them are wonderful resources from our partners’ websites. Others hits lead back to partisan or for-profit organizations. Still other results are simply wrong: incorrect, inappropriate or both. When you search the Civics Renewal Network, you know you’re getting the best of the best: quality, proven teaching aids self-selected by each of our partners and coded to grade-level, curricular standard and teaching strategy. Start by clicking the magnifying glass icon in the upper right corner of the CRN home page. A Search entry field will appear. Enter a simple or complex term into the Search Field and click the Search button. Within a matter of a seconds, a set of pertinent, proven resources will be displayed on the page. Sometimes, the number of resources returned by a search will run to several pages — just like Google. In such cases, we provide a series of reductive filters to help you find just the resources that fit your particular needs. Use the filtering tools in the left-hand sidebar to refine your results. 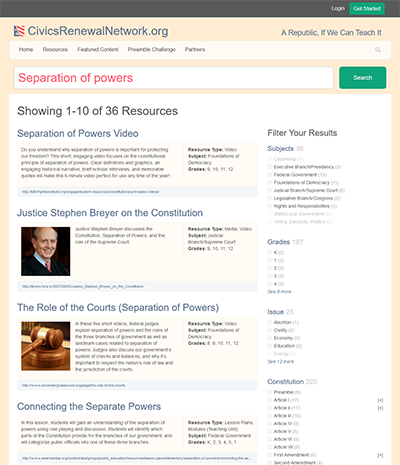 You can filter by Subject, Grade, Issue, Constitutional Article, Amendment or Right, by the Type of resource, by the skills it builds (Teaching Strategy), by the Standard it teaches to, and by the partner organization. Some of the filtering entries (e.g. : First Amendment) have sub-entries. The presence of sub-entries is denoted by a plus sign [+] at the right hand side of the column. Clicking the plus sign (+) symbol in such cases causes it to expand and reveal the checkbox-selectable items contained within. Click the checkbox to enable the filter – reducing the set of displayed results to just those that match the filter setting. Click the checkbox again to remove that filter. Next to each filter, in parentheses, is listed the number of resources from the current search results set that match that filter.